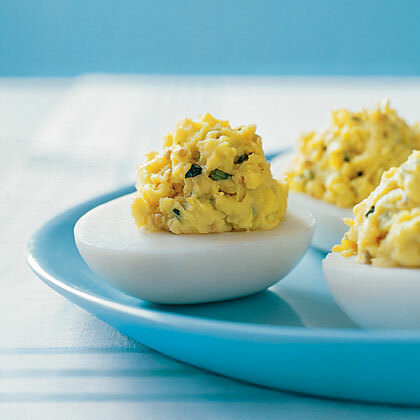 Classic deviled eggs, or stuffed eggs, are a must at picnics, cookouts, and covered dish dinners. The sprinkle of tarragon in these stuffed eggs adds a nice bit of fresh flavor. 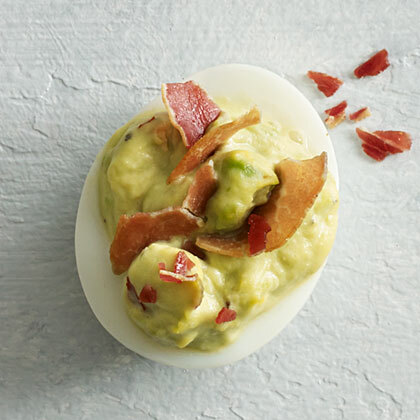 An ode to Dr. Seuss, both you and your kids will love snacking on Green Eggs and Ham Deviled Eggs featuring avocado and prosciutto. 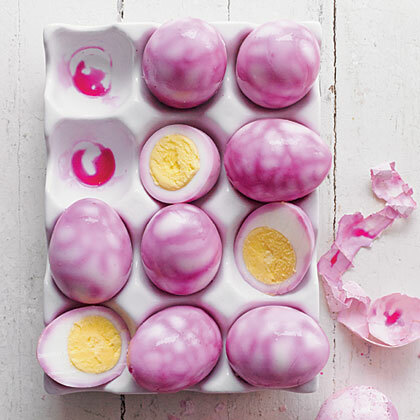 Pickled beets give Chinese tea eggs a colorful flavor makeover. 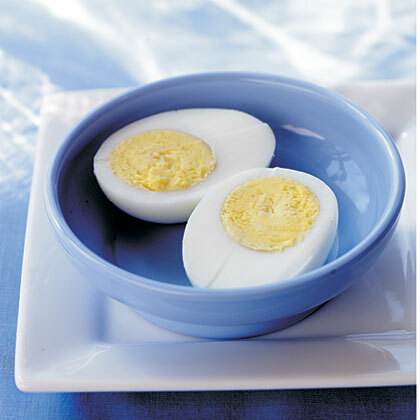 To get a finely etched marbled look, peel eggs after 2 hours. 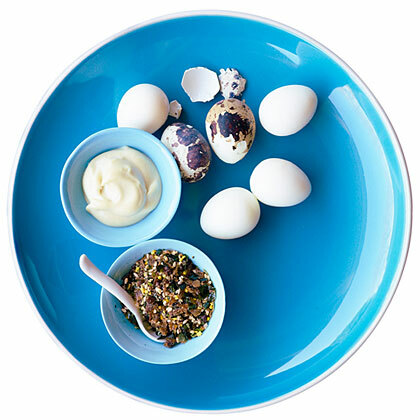 For more pronounced pickled-beet flavor and uniform color, chill eggs for the full 24 hours. 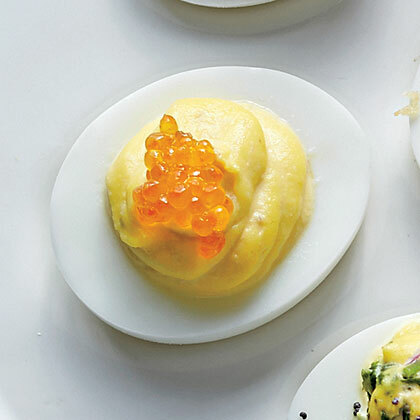 Impress your guests with Trout Caviar-Horseradish Eggs—an elegant twist on a classic deviled eggs recipe. This recipe for savory Country Ham-Breadcrumb Eggs adds a comforting spin to deviled eggs with country ham and Swiss cheese. 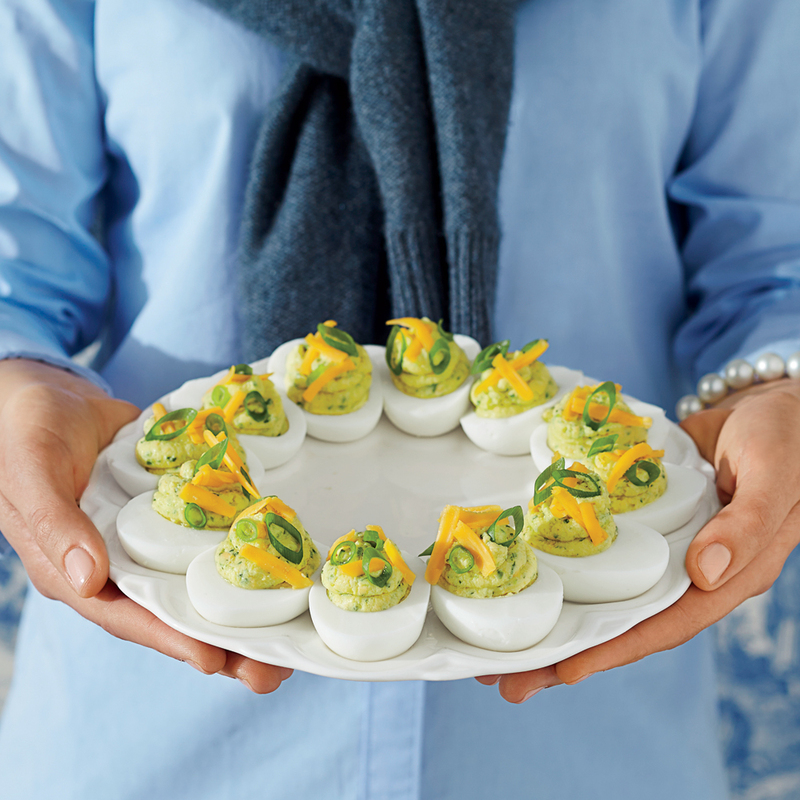 Deviled eggs never go out of style, and this recipe for Classic Deviled Eggs is one that every Southern cook should master. 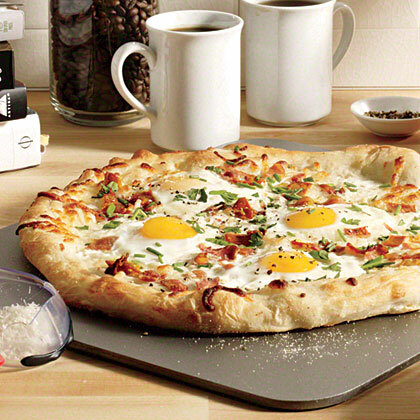 Bacon and eggs, those American breakfast staples, go Italian in this quick pizza. 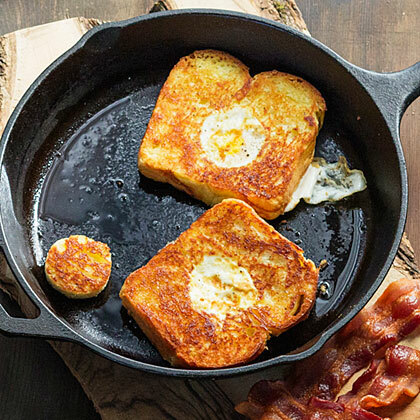 Be careful not to overcook the eggs--you'll want to sop up the golden yolk with your crust. Easy Muffuletta Deviled Eggs melds the flavors of olives, egg, and salty salami. Is there a trick to peeling boiled eggs? 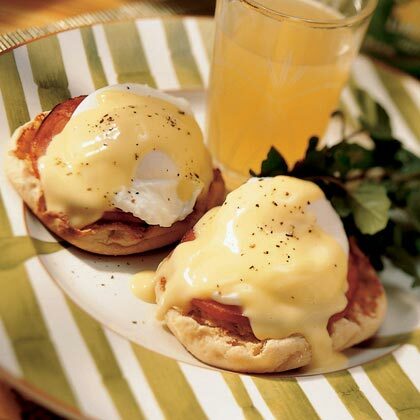 Eggs Benedict is a hallmark of weekend brunches across the country. First poach the eggs; let stand in cold water. Then make the hollandaise and let it stand at room temperature. 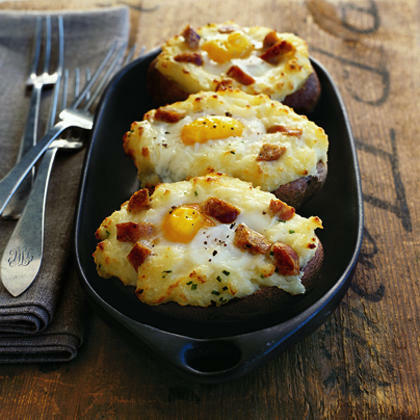 When muffins and bacon go in the oven, reheat eggs. The South's iconic appetizer fuses with the nineties' obsession with Tex-Mex. 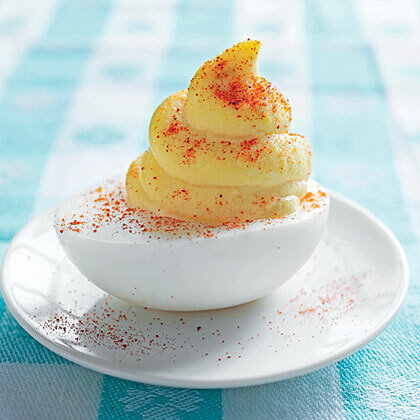 The filling for Southern-style basic deviled eggs is nothing more than egg yolks, mayonnaise, mustard and sweet pickle relish. 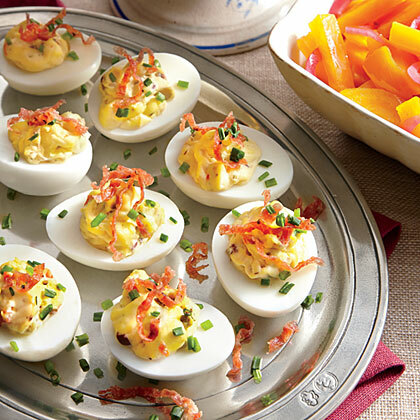 These deviled eggs are perfect for potlucks, tailgates, and summer suppers. Now, if you have trouble peeling hard boiled eggs, here's a trick: Once cool, crack the eggs and place in cold water for 10 minutes, then try peeling them. The peels almost always come off much easier. You can also place the filling into a piping bag for a pretty, swirled finished look. Deviled eggs are delicious any time of year, and even more so when you can decorate them with fun fall designs. 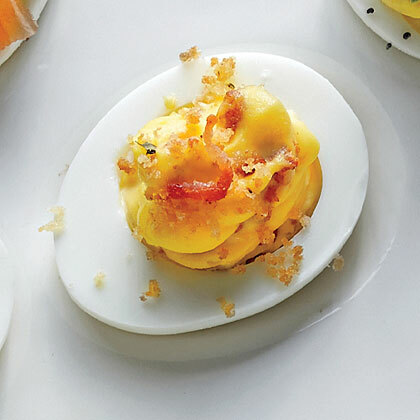 These deviled eggs each have a secret ingredient that dresses them up for Halloween. Make this classic appetizer to enjoy at your next Halloween gathering. If you're traveling with the Halloween deviled eggs, here's an easy tip: Prep the eggs ahead of time, but wait to fill them until you arrive. Store the filling in a zip-top bag, then simply snip the corner for easy piping. Happy haunting! Outerlands restaurant in San Francisco serves this take-off on the classic eggs-in-a-frame. We borrowed the idea for camp. You'll need to pack a bread knife and a 1 1/2-in. round cutter or a tricked-out Swiss Army knife. Think of this appetizer as deconstructed deviled eggs, with both a spicy sauce and a seasoning mix for dipping. 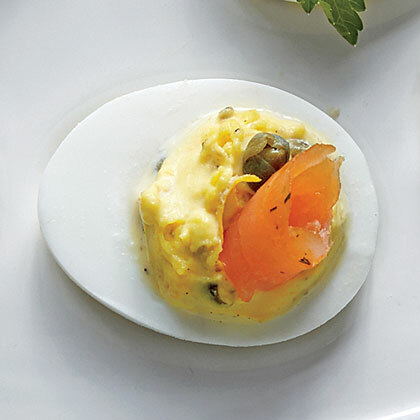 This zesty recipe for Smoked Salmon, Lemon, and Capers Eggs dresses up ordinary deviled eggs with salty smoked salmon.